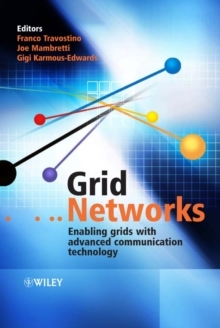 Grid Networks describes the convergence of advanced networking technologies and Grid technologies, with special focus on their symbiotic relationship and the resulting new opportunities. Grid technology is applicable to many implementations, Computational Grids, Data Grids, Service Grids, and Instrumentation Grids. The authors cover a breadth of topics including recent research, featuring both theoretical concepts and empirical results. Beginning with an overview of Grid technologies, an analysis of distinguishing use cases and architectural attributes, and emerging standards. Travostino et al. discuss new directions in multiple networking technologies that are enabling enhanced capabilities for Grids. An appendix also provides an overview of experimental research test-beds and prototype implementations. These topics will enable network experts to design networks to best match Grid requirements, while Grid experts will learn how to effectively utilize network resources. Grid Networks: Enabling Grids with Advanced Communication Technology: * Bridges the gap between the communities of network and Grid experts. * Covers new network requirements posed by the Grid, and the paradigm shifts prompted by Grid applications. * Discusses basic architectural concepts and directions related to the integration of Grid and networking technologies, especially those that elevate network resources to first class entities within Grid environments. * Details new directions in networking technologies for the Grid, including Network Infrastructure & Management, Service Provisioning, High Performance Data Transport, Performance Monitoring, Reliability, and Network-Assisted Service Frameworks. * Provides an overview of advanced research testbeds and innovative early implementations of emerging architecture and technology. Many communities will find this book an invaluable resource, including engineers and product managers, research scientists within academia, industry, and government agencies, advanced students and faculty in distributed systems courses, network and systems architects, CIOs, administrators of advanced networks, application developers, and providers of next generation distributed services.